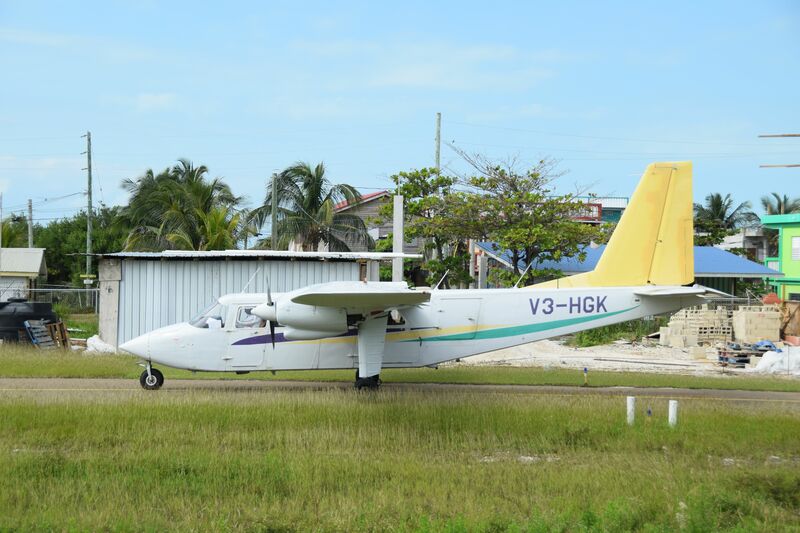 Soon to be a very rare bird: Romanian-built Britten-Norman BN2 Islander of Maya Island Air. Taxiing for runway 23 at San PedroTown, Belize (SPR), 25.11.2017. Check out the August 2017 edition of the UK publication "AirlinerWorld". There's an eight page article about the latest production model of the Islander. With more than 1250 built since 1965, in Northern Ireland, the type seems to be alive. I can see them on a daily basis arriving/departing my home airport (KWST) in Rhode island. New England Airlines has a fleet of three. I did not know they were produced in Romania as well. I did not know they were produced in Romania as well. Like the BAC 1-11. And the Renault 12. This is soon to be very rare, since Maya Island Air is getting rid of them. AFAIK they are the only ones operating as active airliners in the Americas. Note the company logos have already been removed. Glad I got to fly in one on one trip down here. Cape Air was using Islanders at their San Juan hub. Not sure if that's still true since Hurricane Maria tore through. Cool plane, is the Romanian build more unique? I think Cape Air is all 402s and the 2(?) ATRs. Vieques Airlink and Air Flamenco fly Islanders and Trislanders from the smaller San Juan airport; Isla Grande. Was in SJU this week and didn't see much activity at SIG but that was just the one instant I looked. Usually you see them flying low to Culebra and Vieques, etc. I�m not aware of anyone else in the Western Hemisphere flying the Romanian-built Islanders. But regardless, the Islander isn�t exactly common in this part of the world, regardless of where you are. There are a couple of small knots of them here and there, but for most people, you could live your whole life and never see one. I�m fortunate to have had the opportunity to fly on one of Maya Island Air�s airplanes, and now they�re about to be retired. I have flown in them quite often in the Caribbean from the 80s to the 2000's. Last flight was from St Barth to St Maarten probably 2009 or 2010. When it was Islander I always tried to get sitted in the front seat row right seat (aside pilot) or second row (preferably right seat) to see over pilot shoulder just to scan pilot operations. I was to the point I almost figured I could nearly fly the airplane. (you know the story, pilot disabled and here comes the guy who savec airplane and passengers ;^D). What I also liked with Islander is how cabin was low over ground level and how noisy those piston engines could be.. I with you Eric. First choice is right seat next to pilot so at least we have a chance should something happen to him/her. I have not logged any pilot in command time in nearly 22 years but I would give it my best shot. Second choice is second row, right side so I can observe the pilot/flight instruments as well. BN-2A was a stable and easy to fly plane but very noisy.